Many regional and global environmental water quality issues involve atmospheric transport and deposition of specific pollutants. Examples of water quality impairments include acidification of sensitive streams and lakes, nitrogen deposition and subsequent eutrophication of estuaries and coastal waters, and mercury transformation and subsequent accumulation and toxicity to fish, other wildlife and humans. In addition to direct pollutant inputs, rainfall/snowmelt drives runoff from the watershed which results in significant nonpoint source pollutant loadings to surface water bodies and groundwater resources. 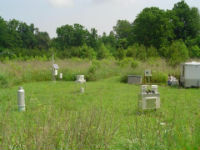 CBNERR participates in three national atmospheric monitoring programs (NOAA/NERR System-wide Monitoring Program and the National Atmospheric Deposition Program’s National Trends Network and Mercury Deposition Network) and supports local, regional and national Integrated Coastal and Ocean Observing Systems. Measured Physical Parameters: Air temperature, relative humidity, precipitation, wind speed and direction, barometric pressure and photosynthetic active radiation (PAR).